Owen has been with Plenitud from the beginning. Owen, Paula, and a few other like-minded individuals envisioned and launched Plenitud. In his current role of Executive Director, he has a hand in almost all of Plenitud’s many activities. He gracefully manages this magnificent workload with a smile and his incredible sense of humor. His specialty is in the management of permaculture systems and bio-construction. Owen is also the grant writer, staff manager and financial manager. His passions include meditation, surfing, and creating and listening to inspirational music. Paula has been with Plenitud from the beginning. She is primarily in charge of the coordination of Plenitud farm, events, and community projects. Paula manages the well known Plenitud kitchen-it’s a surprise to all who visit the farm seeking knowledge about sustainable agriculture and leave talking only about the vegetables that were turned into one of the best meals of their lives. Paula’s primary and most important ingredient in everything is Love. She has an infectious laugh that inspires all, and she is always getting the dance party started. Katie integrates Plenitud’s vision and values into all activities on the farm. Originally from Maine, she has embraced the tropical climate with open arms. Katie brings more than 8 years of experience in horticulture with a focus on the cultivation and processing of medicinal plants. She manages the different Plenitud services relating to the gardens, cooking, and taking care of all of us. Katie’s beautiful voice is constantly flowing through the gardens of Plenitud, and her laughter and service attitude are contagious. Mica is her loyal companion in the garden-they are two peas in a pod. Rebekah started at Plenitud as an intern from the University of PR and now is an essential part of Plenitud, helping to manage the agricultural efforts on the farm. She has a passion for serving the youth of P.R. and beyond through agro-ecological farming, and she loves mentoring youth & beginning farmers in our programs. Rebekah is devoted to our crops and the health of the soil; she works super hard in the fields, and she is capable of anything. She is also a talented musician and singer, and she loves God. Carson, brother to Owen, grew up in Gainesville, Florida. Inspired by the work of Plenitud while visiting his brother, he decided short visits were not enough and joined the team full time. Carson is a man of many talents. He leads the Plenitud Living Arts program, and he is the videographer and photographer of the project as well as a gifted musician leading the Plenitud Band! Carson is a certified professional in Rainwater Harvesting, which he practices at Plenitud’s educational farm and through the different community rainwater harvesting systems that he designs, implements, and maintains. He is also a talented builder, carpenter, plumber, and all around handyman extraordinaire who is always ready to help someone in need. JD is from Massachusetts, and he has worked at Plenitud for 7 years, focusing on permaculture design, implementation, and education in the tropics and northeastern United States. JD has also stepped up to do the needful on the administrative side of the organization, and he now assists with grant writing, finances, fundraising, and supervising the Americorps VISTA service members. JD is always smiling, and he is an avid cyclist, farmer, and musician. Edwin has worked in agriculture with Plenitud for 7 years, since the project arrived in Las Marias, P.R. The Plenitud farm would be lost without Edwin’s loyal companionship and corny jokes. He is an expert in masonry, carpentry, plumbing, and now bio-construction. He has lived in Las Marías all of his life and is an experienced farmer. He applies his ‘jibaro’ wisdom and helps with the maintenance and development of the farm. He also likes to cook and sharpen his machete. Tito is originally from Las Marías and has worked with agriculture since he was young. Tito is devoted to his family and is very grateful for the chance to help support them. Tito is a crucial member of the team because no matter how hot it is or how rigorous the task is, he is always smiling and listening to bachata. His good attitude is contagious! Gina arrived at Plenitud seeking to learn about farming. 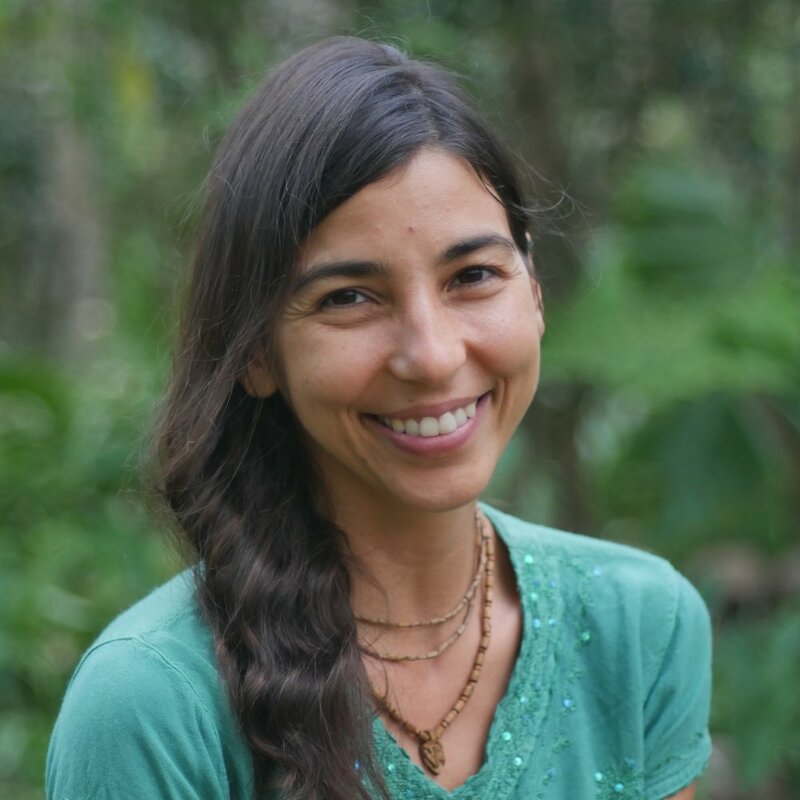 The resonance she felt with permaculture and the Plenitud community has kept her involved for nearly a decade. From helping at the farm, in the kitchen, with workshops, or with teaching yoga, she is always willing to serve where needed. This year she joined us as an Americorps VISTA service member, helping to improve our educational programs and strengthen our outreach initiatives. Gina has a passion for engaging youth through experiential education, and she loves getting lost in the forests and rivers (but not at the same time). She pays great attention to detail and is a great listener, unless a bird flies by. She loves birds and we love having her on our team. Cristina graduated from the University of Puerto Rico with degrees in Business Administration and Hispanic Studies. She loves writing and editing, especially if it is related to nature and education. She worked for University of Puerto Rico Sea Grant College Program for eleven years; three of them editing, and eight of them as communications coordinator for the Program. Now she is giving service to Plenitud PR through the Americorps VISTA program along with Gina and Héctor. She feels thankful with God, with life, and with the people that have come across her path to get her here. Héctor graduated from the University of Puerto Rico and the Interamerican University with degrees in Business Administration (Computer Information Systems and Human Resources Management). He has extensive experience in the areas of customer service and retailing. For more than 30 years, he has practiced Tae Kwon Do, a Korean martial art that he understands as a lifestyle and a way to serve others. He enjoys nature, especially observing the birds and flowers. He is giving service to Plenitud PR through the Americorps VISTA program along with Gina and Cristina. Pablo is a civil engineer with a passion for bio-construction with Superadobe and Bamboo, and he started a project called Bambú Pueblo to develop an industry and culture of bamboo in Puerto Rico. He also loves to get lost in his flute and to ride waves on his surfboard. He received his masters degree from the University of P.R. doing innovative research on the strength of bamboo. He has been joining efforts with Plenitud for over 6 years, developing a bamboo plantation at the farm and curriculum for bio-construction workshops. Pablo and Owen make a dynamite team together, and everyone loves their workshops. Mumy, is an experienced dancer and performing art artist and educator. She brings a lot of experience to our Youth Program, sharing her knowledge and passion for the arts. Mumy loves nature and she shares that teaching performing arts in natural spaces like Plenitud have a deep effect on the creativity of children and everyone. We dream to create an Art Therapy program with which we can help our community which is hungry for the arts. Yaitza, better known as Sita is originally from Ponce, Puerto Rico. She obtained her masters degree in Music from Temple University and has played the cello with renowned orchestras around the world. Even then her humility and simplicity speaks volumes and the way she play those strings will move the chords of your heart. Her passion for music, yoga and kirtan (devotional music) is contagious. She helps bring artist to Plenitud and create music events, teaches music and yoga in the community. Natalia, sister to Rebekah, came to Plenitud not just to beautify the space but also to help us bring arts outreach to our community. She graduated from the Columbus College of Arts and Design in Ohio with a degree in Fine Arts and Art Therapy. Art is the way she expresses herself, and she is very passionate about it. Natalia is joining our Youth Program and helping us bring art classes to our partner schools and the surrounding community. She also loves laughing, contemplating philosophy, the beach, and dancing. Magali is a mother to all of us, she has lived in Las Marías her whole life and raised her family through agriculture. She is simple,very focused, humble, hard-worker and a blessing to have around. Magalis serves in the gardens with us as well as in the kitchen, doing the whole process of farm to table! She loves running four tracks and planting in the farm. Maco is the Plenitud Bodyguard that watches over the gate and makes sure the farm is safe. His favorite pastimes are to follow Owen all around the farm and play with his dear Mica. Maco is so expressive, that after getting to know him, you know that he is almost at the human platform. He is very intuitive and smart, and has demonstrated over a number of times his caring skills by warning people about river floods. But do not pet him while you are at Plenitud, he is still the guard dog!